The TransMilenio bus rapid transit (BRT) system in Bogotá, Colombia (pictured above) is one of the leading examples explored in Taras Grescoe’s “Straphanger: Saving Our Cities and Ourselves from the Automobile.” Photo by Mariana Gil/EMBARQ Brazil. Darío Hidalgo is the Director for Research and Practice at EMBARQ and a frequent contributor to TheCityFix. With more than twenty years of experience as a transport expert, consultant, and government official, Hidalgo has taken part in urban transport projects and taught training courses in countries throughout Latin America, Asia, and Africa. Just like in the movies: two thumps up, five stars, and wonderful! Although read long after its 2012 release, Straphanger: Saving Our Cities and Ourselves from the Automobile by Taras Grescoe made for great holiday reading at the end of 2013. Of course, I am biased in my review since the book preaches to the choir of sustainable urban mobility and development supporters. Nevertheless, I hope this book will land in the hands of people outside our choir and help to change the mainstream views that continue to gridlock our cities and deteriorate quality of life for billions of urban residents. Straphanger gave me the opportunity to virtually revisit many cities I regard as great urban and transport examples around the world, including New York City, United States; Paris, France; Shanghai, China; Montréal, Canada; and my home city of Bogotá, Colombia. It also allowed me a window into a few new places: Vauban, a nearly car-free district of Freiburg, Germany; Copenhagen, Denmark’s super-bikeways; and Tokyo, Japan’s train megalopolis, among them. I enjoyed Straphanger because it is a personal take on what many experts have tried to convey for a long time: relying on automobiles is unsustainable, decreases the vibrancy of urban life, and contributes to traffic crashes and fatalities, air pollution, and physical inactivity – extremely costly issues that also manifest themselves through deepening social inequities. Grescoe uses material from pioneering authors and scholars in the field of urban sustainability such as Jane Jacobs, Lewis Mumford, and Robert Cervero, in addition to referencing conversations he shared with some of them. He also shares interactions with political leaders, including Antonio Villaraigosa, champion of the Los Angeles metro; Enrique Peñalosa, who helped transform Bogotá into a leading world reference for sustainable mobility; and Janette Sadik-Khan, the Transport Commissioner of New York City who has worked to create more pedestrian and bicycle-friendly streets through efforts that include the pedestrianization of Times Square. Fairly, Grescoe also refers to opponents of his views, ranging from modernist icons Frank Lloyd Wright – mastermind of Broadacre City, the ultimate low-density, helicopter oriented suburb – and Le Corbusier – known to Robert Moses as the “man who made the modern metropolis safe for the car” – who wanted to flatten Paris and Bogotá in favor of creating modern towers surrounded by wide highways. Throughout Straphanger, Grescoe shows that change is possible and indicates leadership, planning, and funding as necessary requirements for changing paradigms in urban development. Above all, he gives great importance to civic movements that stopped the construction of urban highways in New York City, Vancouver, and San Francisco, thus aiding the momentum behind bicycling culture in these cities. My favorite chapter, naturally, is Grescoe’s chapter on Bogotá – “The revenge of the Loser Cruiser” – in which he was able to overcome his aversion to buses. 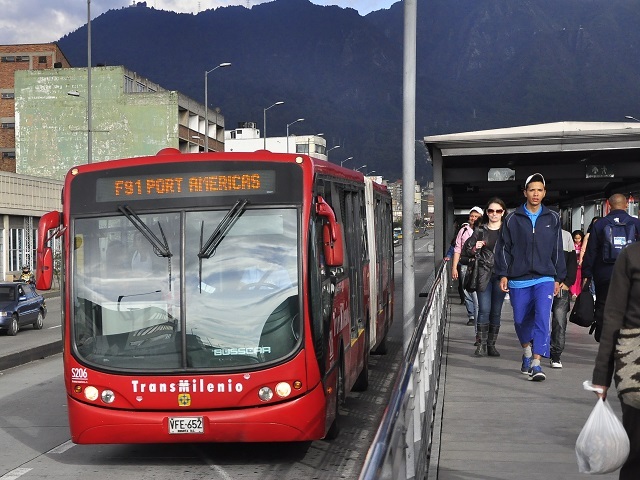 After discussing and riding Bogotá’s TransMilenio bus rapid transit (BRT) system with many local transport experts – including yours truly – Grescoe finally gave buses a chance. Indeed, a conversation I had with him – referred to in the book as “Bogotá is Curitiba on Steroids” – translates into a thorough explanation of what makes BRT successful: median busways, level boarding, pre-payment and fare collection systems, large buses with multiple doors for boarding and exiting, information technologies to support operation, providing user information, and distinctive branding. However, it also reflects my concern with the current low-quality service offered by TransMilenio, epitomized by excessive crowding – there is an urgent need for maintenance, improvement, and expansion. I strongly recommend reading this global guide to better cities and better transport. Even if you have your own beliefs urban mobility and development, at the very least take this chance to explore sustainable mobility examples from around the world. When you get around to reading Straphanger, leave your thoughts below in the comment section!